"CACTUS WREN" by Tina C. Wells, Acrylic on canvas, 8"x8"
A quick get-away took us to Carefree, AZ. We sat on our secluded desert porch and watched this little cactus wren hop from plant to plant. I love the polka-dotted belly and tail. Over the Memorial Day weekend, we took a trip to see my husband’s family in AZ. 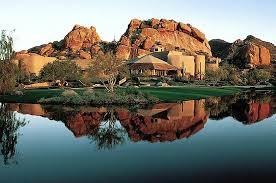 With built-in babysitting, we dropped off the kids in Phoenix and headed for an overnight stay in Carefree, Arizona. It doesn’t sound like a real place, does it? More like a state of mind, but actually Carefree is a real location just northeast of Phoenix. It does live up to its name; truly I felt as though I was getting away, breathing deeper, relaxing in this desert oasis. Carefree, and its sister town of Cave Creek is all that I want Arizona to be, with its wild-west, rustic charm, a little bit Cowboy and a little bit Indian. There are many small meandering shops with everything from tourist tchotchkes, to specialty western wear, rustic furnishings, and restaurants. Speaking of restaurants, I recommend El Encanto for Mexican fare- so charming with a pond tucked into the courtyard. I got this recipe from my grandmother years ago, but it never fails to please. A great side dish with your favorite mexican or southwest entree. Serves a crowd! Mix ingredients together, bake in greased 9x13 casserole pan 1 hour in preheated 350 degree oven.